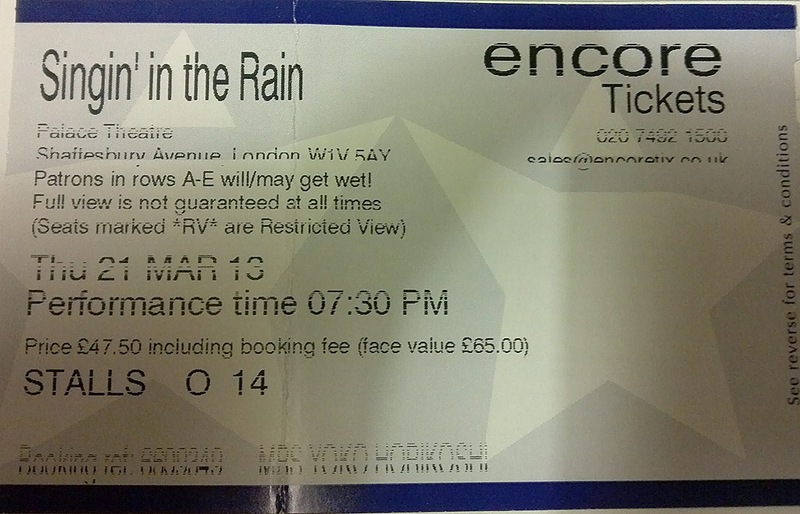 My Travel in London 9 ~ Soho ~ Singin’ in the rain! Mmm…Should I have bought something with the Rosetta Stone motif? There were many kinds of souvenirs printed with the text of the stone in the Collection Shop: Rosetta Stone T-shirts, Rosetta Stone iPhone cases, Rosetta Stone calculators, Rosetta Stone notebooks, Rosetta Stone bags, Rosetta Stone mug cups, Rosetta Stone umbrellas, Rosetta Stone ties, Rosetta Stone USB stick, etc! Yuko phoned me when I was debating whether to buy one of them. She came to the main entrance. I went out of the museum without buying any goods of the Rosetta Stone. Actually you can get them anytime on the Internet. http://www.britishmuseumshoponline.org/icat/rosetta_stone So, I might buy something with the stone motif later! Not to worry! 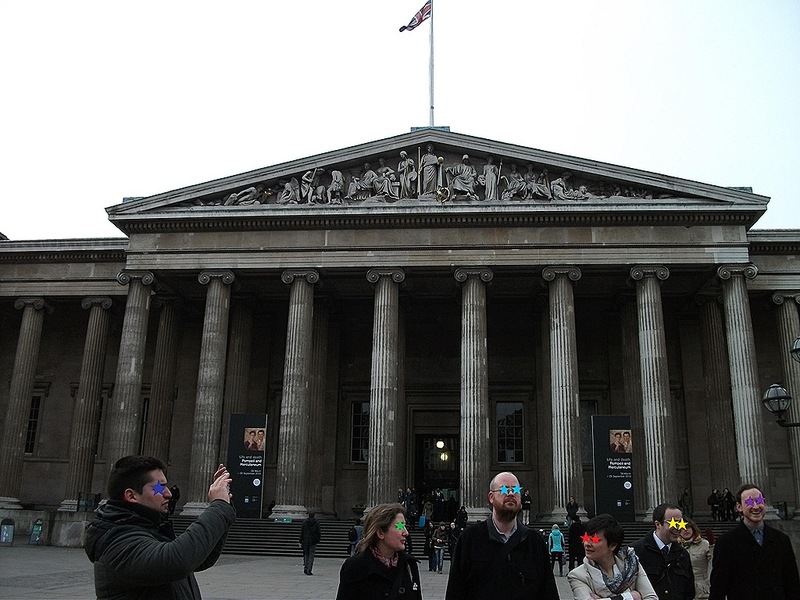 We were in London, which had been named as the best city to visit in the world last year. There were many signposts with detailed maps and street names in town. Besides I could tell the direction because I had seen a map of London many times. 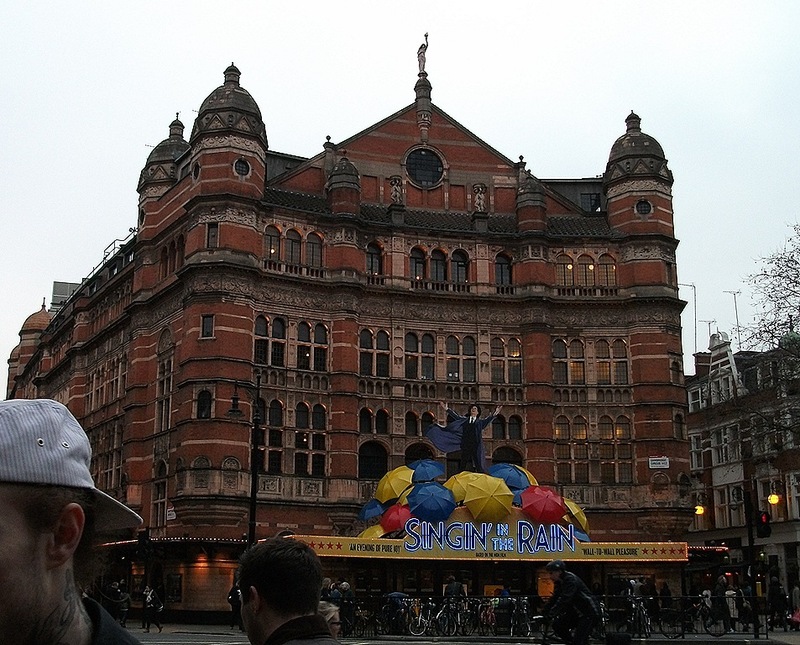 So, without any problems Yuko and I were able to get to the theater: the Palace Theatre. We were supposed to see Singin’ In The Rain in the prominent red-brick building. Yuko and I need to eat something before the musical started. 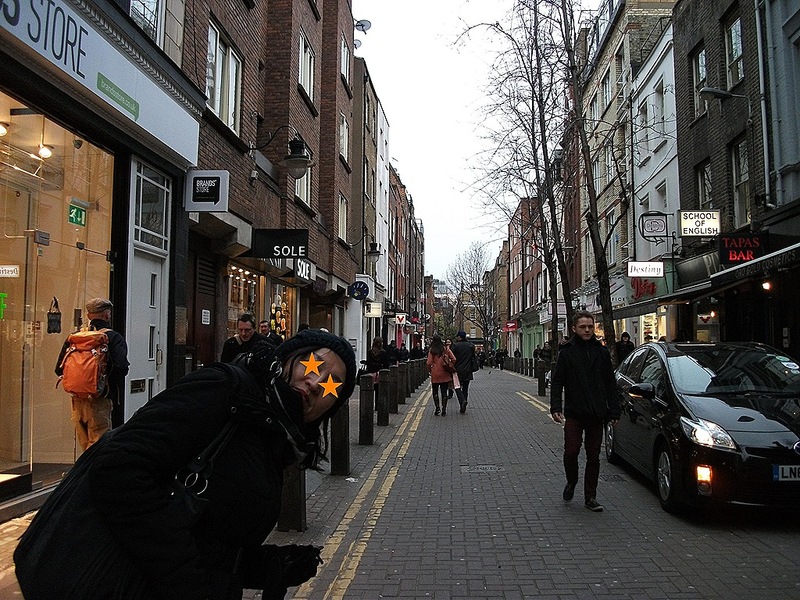 After getting the tickets, we set off to a night town of the West End. Walking from Moor Street to Old Compton Street, we were standing at the door of Café Boheme. We did not have so much time to drift from place to place. So, we decided to have quick meal there. Actually I was too tired to have good appetite at that time, but the French restaurant gave me great satisfaction. I ordered Soupe a l’oignon or a cup of onion soup and Omelette or an omelet with herbs. They were excellent! 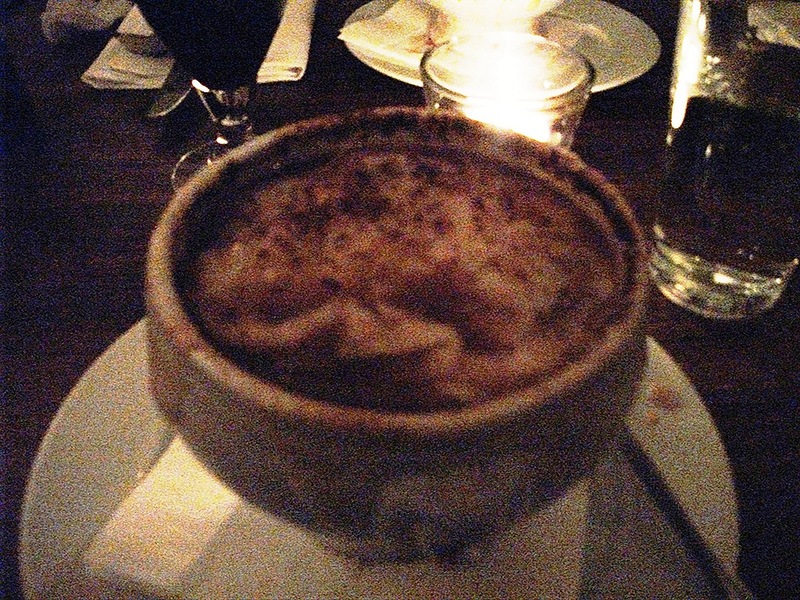 The onion soup was the best I had ever had! The golden liquid gave energy to me! Yuko had the same onion soup and hamburger with French fries. Her dishes also looked really delicious. 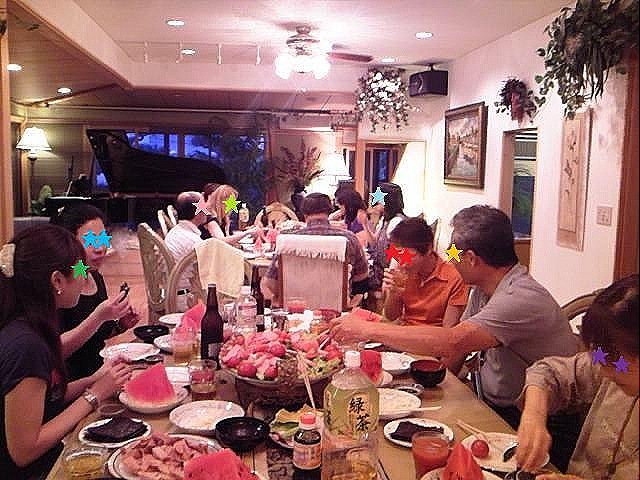 Everyone seemed to be enjoying their food. The atmosphere of the restaurant was very nice and our waiter was gentle and good-looking! Yuko and I had a great time at Café Boheme. At around 7:00 we left the French restaurant and headed to the Palace Theatre. All of the doors of the theater had already opened and were swallowing up people, when we arrived. Climbing up short stairs, we saw a bar floor on the right and many excited people holding glasses there. The interior decorations were gorgeous. I was almost overwhelmed by the historical atmosphere of the theater. Mmm…Should I have worn a more fashionable dress? My seat was O-14 in the Stalls. A-B-C-D-E-F-G-H-I-J-K-L-M-N and O. That is, I was sitting the eleventh row from the front. We were quite close to the stage because there was not a pit on the ground floor for the orchestra, which played above the stage. Yuko was sitting at O-15, which was next to the aisle. We were able to see the actors up close because they acted not only on the stage but also in the aisle. It was as if we were also in the scene. The stage was really wonderful. I could not understand all the actors were saying, but I really enjoyed their performances. They showered large quantity of water on the stage before the intermission and the ending and the stage became like a pool. The actors splashed water to the auditorium seating on purpose while dancing. That was why people sitting from the first to the fourth or fifth row got wet. Of course, they were squealing with delight instead of complaining. The rest of the audience also cheered at the spectacle. At the end of the play, the whole audience gave a standing ovation to the actors, the orchestra, and the rest of the staff. Yuko and I had a really great time! It was raining when we went outside. But no one put up an umbrella. 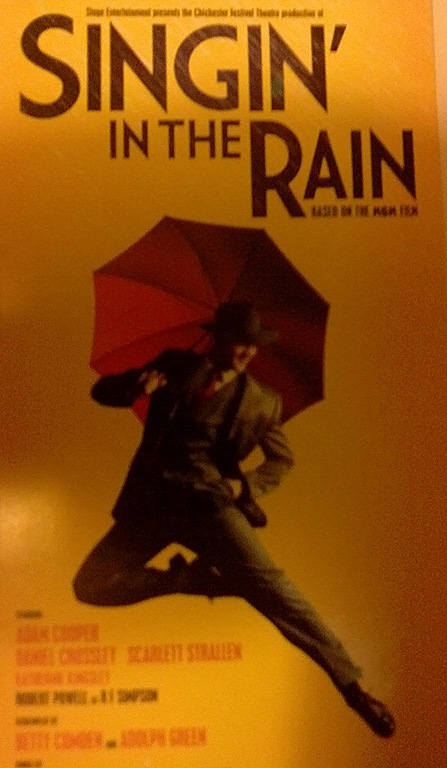 Many people from the Palace Theatre were willingly getting wet, singing in the rain “Singin’ In The Rain”! Lots of people came out from not only the Palace Theatre but also other theaters in the West End. The street was full of excited people. Yuko and I did not know where the underground station was, but we did not need a map. We were just swept along in the crowd and then arrived at Leicester Square Tube Station automatically. These are last words of Sakini acted by Marlon Brando at the last scene of a film “Teahouse of the August Moon” in 1956. Do you know the movie? The setting is Okinawa in Japan under U.S. occupation. Marlon Brando, good-looking, Academy Award-winning, one of the greatest actors at that time, did “yellow face makeup” and appeared as an Okinawan (Japanese) interpreter in the film. Here is the story: Captain Fisby is relegated to Okinawa under the U.S. occupation because he has failed many things. Colonel Purdy sends him to a village named Tobiki to bring local people democracy and to build a school in a shape of Pentagon there. Fisby tries to work hard to complete his mission with Plan B, but Sakaini, the interpreter, mistranslates purposely and controls him slyly. At first Fisby tries to follow Plan B and rejects approach of Lotus Blossom, a geisha, but he gives up following the plan and accepts the geisha’s service, and gradually goes native. Fisby uses all materials for building a school and build a big teahouse instead. He gives up bringing education system to the village, but starts a brewery for brandy there. All of them are local people’s hope and he thinks about their happiness. One day, Purdy asks about his progress of building the schoolhouse on the phone and he thinks Fisby is going crazy while talking, and sends a psychiatrist Captain McLean for him. However, McLean is influenced by Fisby and the local citizens and even starts natural farming there in Japanese kimono. McLean and Fisby channel all their energies into building the teahouse and the brewery business with locals. Purdy notices something unexpected is happening in the village and visits there. He finds out the teahouse has been built instead of a school and local people do not learn about democracy but work hard for making brandy, and gets angry. He orders his man to destroy the teahouse and the brewery. Fisby and people watch everything is being destroyed. At night Fisby and Lotus Blossom say tearful good-bye each other. Sakini comforts him saying he is not a failure. Fisby says he used to worry about not being a success. But he learned the wisdom of gracious acceptance and has got an inner peace between his ambitions and limitations in the small village. They say good-bye and Fisby leaves when Purdy appears to look for him. A senator is using the village as a good model of policy of American occupation. Purdy feels abandoned because photographers are coming for coverage, but he has destroyed everything. But Sakini tells the colonel that destroyed things were water barrels and high quality brandy is hidden and the teahouse was just taken away and is able to be set up again. Purdy is very glad to hear that and calls Sakini an American. Sakini calls people to put everything back. 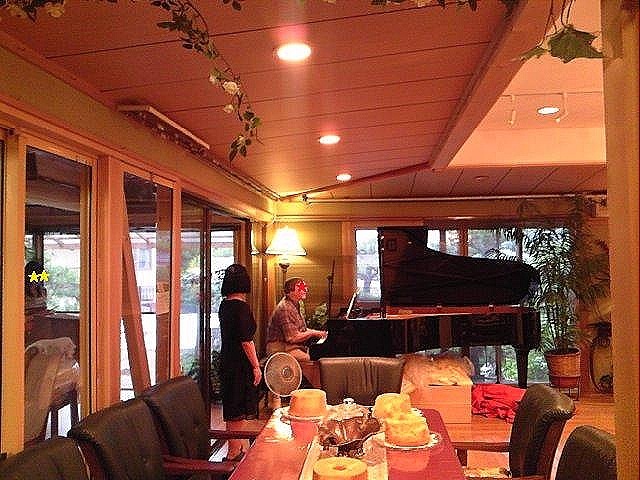 They rebuild the teahouse as singing together. Fisby and Purdy are invited inside under the beautiful moon. Marlon Brando does not look like Japanese at all from the eyes of Japanese at the beginning of the movie, but he has been as Japanese without any discomfort by the end of the film. Some people might disagree with me, but at least he cannot look like an Anglo-American. He hunches to show himself shorter, mimics Japanese action, and speaks Japanese and broken English in Japanese accent during the drama. I think he became a Hollywood star because of not only being good-looking but also his acting skills and his strong sense of professionalism. Although I really enjoyed the film in a class at the university, according to Ms. Shoko Yonaha, a researcher of Okinawa’s entertainment, it was a box-office bomb in Okinawa when it was released there for the first time in 1957. It was because Okinawan thought that the movie insulted Okinawa and its people and caricatured them as colonial population, and protested against the production. Actually, three years before it, in 1954, a play of “Teahouse of the August Moon” was performed on the U.S. Army Base in Okinawa. The promoter tried to put on the stage outside of the base because it was big success, but he had to give it up due to the protest movement. Why did Okinawan people act so repulsively against “Teahouse of the August Moon”? According to Ms. Yonaha, it was because of the scenario that the U.S. force is planning to build a school in a shape of Pentagon, but it is changed to build a teahouse by desire of local people, who regarded it as getting looked down. However, Okinawa in the film is not Okinawa at all, though I have never been there and cannot see its real scenery and life of more than 50 years ago. Okinawa has its unique natural, historical and cultural features and language. The movie looks like a digest of introducing Japan video. This film is not a documentary at all but a comedy. A military satire. In fact, it is more a cynical joke of American military service, in which people follow manuals, never express their opinions, and just obey orders in the vertical and class society, than insulting Okinawan people.For instance, it is interesting that a character Colonel Purdy thinks only about his career advancement because of his wife’s desire, and that he adores adventure but never combats with enemies in the battle field or enjoys a wild life in nature of Okinawa but just reads an adventure magazine in his office. There are many strange things in the film through the point of view of Japanese. For example, in the movie geisha is treated as a prostitute. Probably, people in the U.S at that time thought so. Yet, Lotus Blossom, the geisha, played by Machiko Kyo is very beautiful and charming. Besides, it is really fun that Okinawan people just look like being controlled by the U.S. Army but they achieve what they want by using Americans. So, there is no need to raise your eyebrows if the movie does not depict real Okinawa or Japan. So, why don’t you try to see it as a fantasy once? By the way, the words I introduced at the beginning of this page finished with Japanese word “sayonara”. Marlon Brando said the line and it is interesting that he appeared a film named “Sayonara” next year of “Teahouse of the August Moon”. The opera known by this bouncy Japanese music is The Mikado written by W.S. Gilbert and composed by Arthur Sullivan in 1885 in the U.K. Do you know the opera? If you’re a Westerner, you may have seen it once, or may know at least the title. As the title The Mikado, which is an old nominal designation for the emperor in Japan, tells, the story setting is Japan, and it is said that The Town of Titipu, the subtitle of the play, derives from Chichibu, a town in Japan. Despite that, most Japanese people have not heard of even the title. I might not have known it if I did not have an opportunity to see it on DVD at my class at the university. How come the opera is not popular at all in Japan? Mikado in the opera unlike real emperors in Japan is a dictator like Kim Jon-il in North Korea or Qhadafi in Libya. Besides, all settings and costumes are Japanese-inspired, but they do not show real Japan’s style, and all characters’ behaviors are inconceivable as Japanese in the era. It seems that promoters believe that it would be dangerous to perform The Mikado in Japan because many people might think that they, their culture and country are insulted. In fact, only one newspaper publisher in Osaka make it into an article when the first performance of the opera in Japan was in 1887. It was held in Yokohama near Tokyo at that time, but none of newspaper companies in Tokyo area wrote about it. They ignored the opera, or suppressed the news for avoiding upsetting people. In addition, the title was changed as “Three Little Maids from School”. Probably the promoter and those involved in the opera were afraid of Japanese people’s protest by using the word of mikado. Interestingly, the fact of the first opera performance in Japan in 1887 was erased in its music history, in which the first opera was played in 1894 and the first performance of The Mikado was held in 1946. Moreover, Japanese people couldn’t enter the hall when The Mikado was performed in 1946 in Yokohama because Japan was under American occupation and the hall was for only GHQ. Now, what is The Mikadoerased from Japan’s musical history and removing Japanese audience about? This is Titipu, a town somewhere in Japan, where Mikado rules over the country and has set up “Flirting Law”, by which men have to be beheaded if they flirt with women except their wives. Mikado has a son named Nanki-Poo, who runs away from the palace to avoid the forced marriage with an old ugly bride elect named Katisha, and lives in the town of Titipu disguising as a musician. Almost one year ago, Nanki-Poo fell in love at first sight with Yum-Yum, a cute girl, but he began roaming around because he was shocked at knowing she had a fiancé named Ko-Ko, the tailor. But he comes back to the town since he has heard that Ko-Ko will be beheaded for violating “Flirting Law” and expects to get Yum-Yum . Somehow, Ko-Ko has become the Lord High Executioner when Nanki-Poo returns. Ko-Ko has to kill himself as the executioner and after that he will execute the next condemned. It is impossible physically. So, no one has been beheaded for a while. Mikado notices about that and orders Ko-Ko to execute someone within a month. Otherwise, Ko-Ko has to be killed. Nanki-Poo tries to kill himself because he thinks it is no worth for living without Yum-Yum. Ko-Ko happens to see and stops it. He asks Nanki-Poo to execute him. 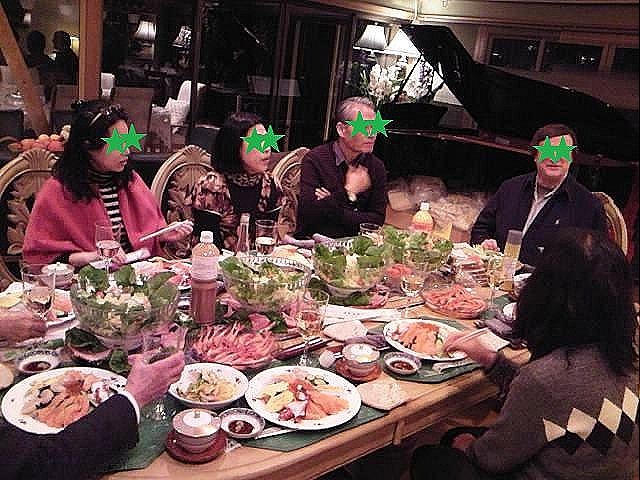 Nanko-Poo accepts it with one condition: to marry Yum-Yum and live together until the day comes when he is beheaded. And Ko-Ko reluctantly admits it. But Pooh-Bah (Lord of the Treasury, Lord Chamberlain, Attorney-General, Chanceloor of the Exchequer, Privy Purse, and Private Secretary ― He has been in the all important positions after other ministers quit their jobs to avoid working under Ko-Ko.) tolds Ko-Ko that the wife has to be buried alive if her husband is executed by the law. Ko-Ko is shocked because he is going to marry Yum-Yum after killing Nanki-Poo. Ko-Ko, Pooh-Bah, and Pitti-Sing, a friend of Yum-Yum, make up a story that Nanki-Poo has already been beheaded and let the young couple leave the town. Then, Mikado appears. He is sorry to miss the execution, but Katisha, Nanki-Poo’s fiancée, finds out the executed person is Nanki-Poo, and Mikado gets furious and decides to kill Ko-Ko, Pooh-Bah, and Pitti-Sing. Well, how and what is insulting Japan? Even the names of all characters do not sound like Japanese at all. The costumes and properties, of course, are inspired Japanese culture, but the characters’ languages and behaviors are very different from Japanese, especially in the setting time. All music except the one I introduced at the beginning of this article is totally European. The scenes on stage is not Japan’s at all, it is a British satire in the 19th Century. The DVD I saw mainly in the class (actually, we saw six versions: two of American, Australian, British, Canadian, and Japanese) was performed in the U.K. in 1966. 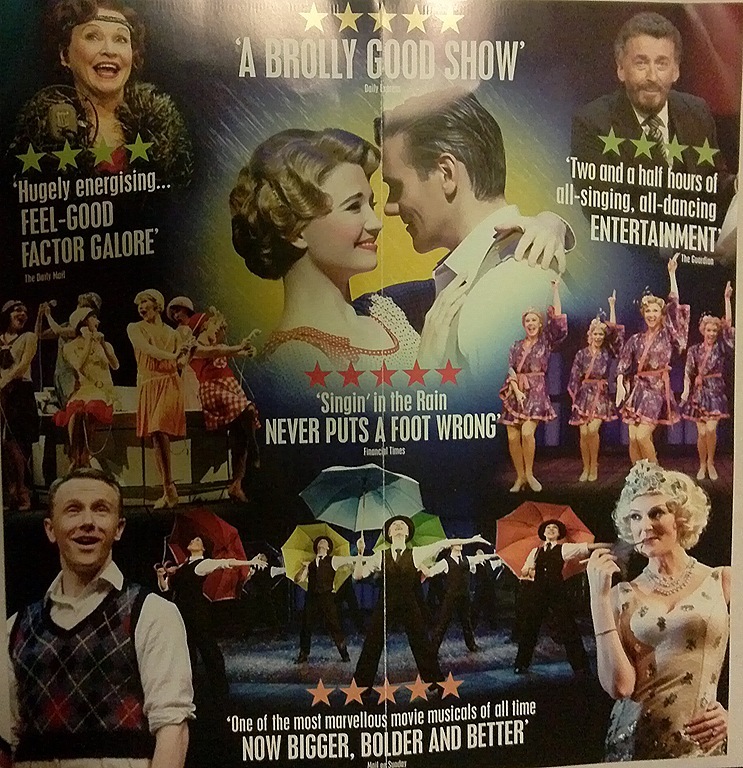 The D’Oyly Carte version. Actors’ performances were, of course, wonderful, the setting was beautiful, all of the music composed by Sullivan was awesome, and all of lines actors say were full of humor and fantastic. I think Gilbert, the writer, was genius. I hope many Japanese will see and enjoy the opera without prejudice and feeling slighted. There is no disgrace to Japan. It is a Victorian political and social satire under the setting of imaginary Japan. The Mikado is a superb art made by two geniuses Gilbert and Sullivan. Play It Again, D! : A wonderful class party with nice friends, delicious food and beautiful music. “Again! ?” D exclaimed rolling his eyes, but began playing the piano. The room was filled with the beautiful melody. As Time Goes By. 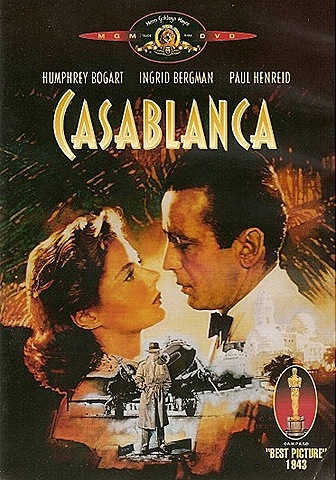 This music is well known for the theme music of the timeless classic “Casablanca” starring Humphrey Bogart and Ingrid Bergman. This is Jin’s house. He invited his classmates and teacher when the class in the first semester was over. We had a class party there. (I’ve written about our previous class party at his house before and mentioned how big his house is. http://wp.me/p16bjt-bp) Jin is very nice and kind, and needless to say, generous. I wrote “classmates” and “teacher” above. Jin and most of the participants at the party took an English class at a university in the first semester (spring and summer), and D is the “teacher”. The class is not a usual conversational class, but quite unusual with movies, which we watch with media literacy, psychology and philosophy. 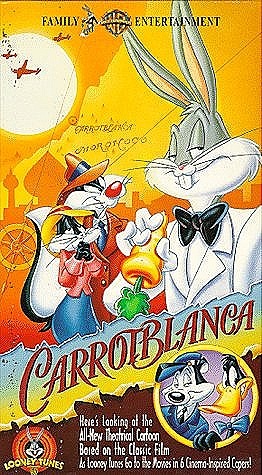 In the first semester, we studied with “Casablanca” and a kind of its travesty “Play It Again, Sam” and a Warner Brothers’ cartoon “Carrotblanca”. 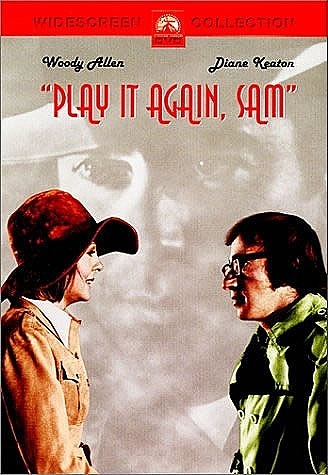 In the opening of D’s “Again?” is, of course, from non-existent line “Play it again, Sam.” As Time Goes By played by Sam in “Casablanca” is wonderful, but I like D’s version, too. 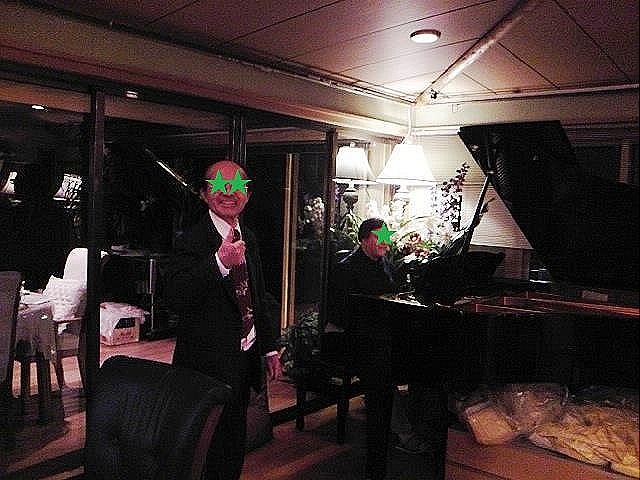 Nice and cheerful friends and delicious food and wonderful music…I hope we’ll have a party at Jin’s house AGAIN! A Class Party: I don’t wanna wake up! “Are there no delicious desserts, tea, and even my friends here? Am I now sleeping somewhere outside and having a wonderful dream? If so, I don’t wanna wake up! I understand Cipher’s feelings!” I shouted when I was enjoying having wonderful ice-cream, cake, jellies with tea and chattering with the participants at a party the other day. I take an English class at a university, but the course this academic year was over last month. 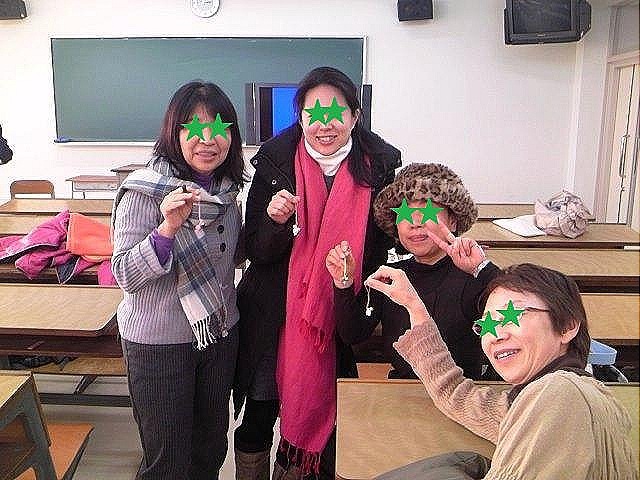 Some of my classmates and our teacher had a party after the final class. 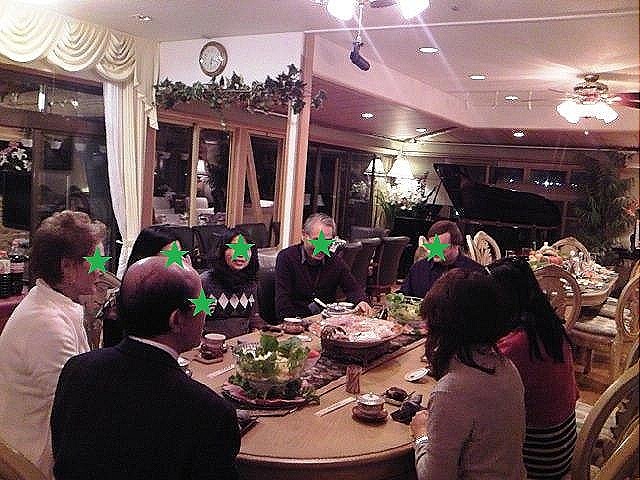 Jin, a friend of mine, invited all of us to his house this time. Jin’s residence is so spacious that I always joke, “I’ve heard that people are sometimes found as mummies in his house,” or “There’re bus stops in the corridor at his house and you have to take a bus to go to the bathroom.” In fact, one of the rooms has more than nine dining tables and looks like a restaurant or a banquet hall. 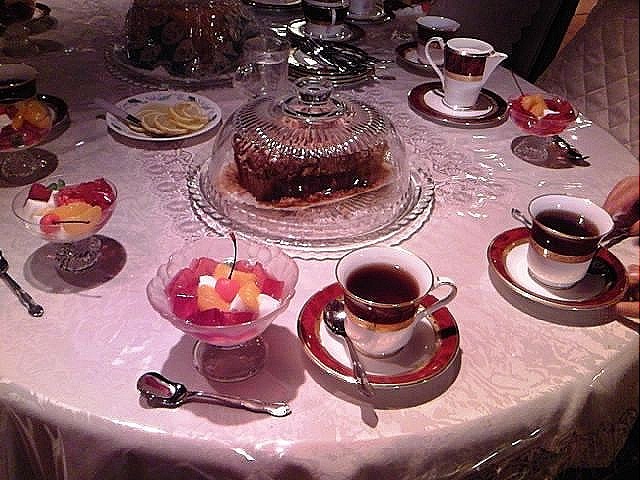 Incredibly, the participants at the party moved to table to table for tea, dinner, and dessert. That is, we sat at a table and had some tea when we arrived at his house, after having some small talks we moved to another table for dinner, and then we went to another table for dessert! 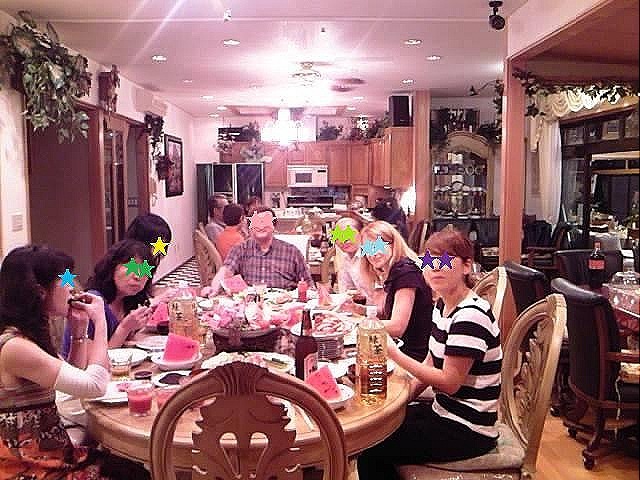 Jin’s wife had prepared for tea, dinner, and dessert on each table before we arrived. In doing so, she didn’t need to walk around in the big room during the party. “There is no spoon.” is what Neo, played by Keanu Reeves in the film, says to himself at the scene when he is going to rescue one of his fellows to overcome fear. Actually, the line appears before the scene in the movie. Neo sees a boy sitting on the floor holding a spoon. The boy stares at the spoon. Then the spoon starts bend over and quickly springs back to its original shape. The child looks up at Neo and hands him the spoon. Boy: Do not try and bend the spoon. That’s impossible. Instead, only try to realize the truth. Boy: There is no spoon. Boy: Then you’ll see that it is not the spoon that bends, it is only yourself. In the film, The Matrix, people believe that they have normal daily lives, but the truth is that they are sleeping in each capsule and having dreams. The world is no longer human-beings’. The computer controls everything, and it uses humans’ bio-energy as its batteries. But our teacher at the class tells us that it’s not only in the film, but also all of us are just having a dream. According to him, nothing you see means anything, and everything has no meaning. So, one day I asked him, “Is this class also meaningless?” during the class. He replied, “Yes!” with a big smile. I think I understand his theory, but, yeah, it has no meaning. I had a wonderful time at the party. I really enjoyed talking to my friends over delicious food, and even listening to our teacher play the piano and some flutes. But the teacher said, “This is just a dream.” Do you believe you’re just sleeping? Yeah, we seldom realize we’re dreaming….There’s no blog here. There’s no PC before you…. What I saw at the class yesterday after the Cheat was Broken Blossoms. Broken Blossoms is an American film released in 1919. The movie has a significant feature. It’s that a white actor plays a Chinese man with thick “Yellow Face” makeup. “Yellow Face” means that the white actors play roles of Asian people with makeup in movies. It was an institutional racism in Hollywood and had continued until the 1960s. In 1910s white people were afraid of the growing number of immigrants especially from Asia because of the fear of losing jobs and wealth by them. The fear had increased since Japan defeated Russia in Russo-Japanese War in 1904-05. “Yellow Face” can be said that it has its roots in the fear for Asian people. And it’s a kind of discrimination called “Yellow peril”. Broken Blossoms is a tragic love story between a Chinese man and a white girl. The Chinese man was played by a white actor named Richard Barthelmess. He was a quite good-looking and didn’t look like a Chinese man with the makeup at all. But it must have been a taboo that Asian people and white people loved especially Asian men and white women those days. That’ why, someone white had to play the Chinese man for the film. Besides, there were no Asian actors except Sessue Hayakawa in Hollywood at that time. And no one must have wanted to see any unknown Asian actors at the theater. It was necessary for movie productions to let a famous popular star such Barthelmess play a role of Asian man for high box-office profits. A Chinese young man named Cheng Huan has a kind of missionary to teach Buddha’s teaching of peace to Westerners. He goes to England and tries to engage in mission work, but it’s difficult to achieve his mission for him. He gets addicted to opium and starts to live in Chinatown as a shopkeeper. He often sees a white girl from his shop window and has little passions to her. The girl is abused by her step father, who is a boxer, and lives in horror. One day she is hit by the step father terribly and runs away from home to Cheng Huan’s shop and faint there. Cheng Huan looks after her gently, naming her “White Blossom”. Both of them have a wonderful time. For Cheng, he has his dream girl in his house, and for the girl, she is gently taken care and relaxing, escaping her step father’s violence. But such a happy time doesn’t continue long. The girl’s step father finds out where she is and takes her home forcefully. He hits the girl so hard and kills her finally. Cheng Huan comes to the girl’s house and finds her. But it’s too late. The girl is dead. He shoots her father dead. He takes the girl’s dead body to his shop and commits suicide. I haven’t been to China and probably learn about the country by reading and seeing images on TV and movies. Perhaps it was the same for most American people in 1910s. 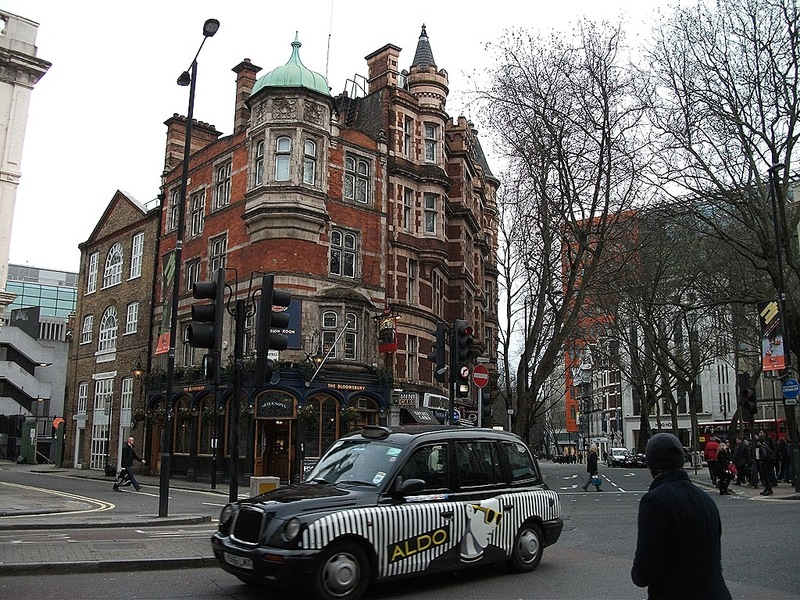 The scene of the film is Chinatown in London. There many poor foreign people are wriggling. Most of them are opiomaniacs. Many of them are gambling and fighting violently. Some white women are there, but all of them are prostitutes. The main character of the young Chinese man is kind, but many audiences could have dark images for Chinatown. Many American people could learn many things through the movie. Chinatown is dangerous, you shouldn’t get involved with foreigners, especially Asians, Asian men and white women never get together, you should have a proper family and so on. It’s the same as the Cheat. Anyway the movie was interesting because I was able to learn the trends in the U.S. in 1910s, especially “Yellow Face”. I hadn’t known about the rule of Hollywood until I took the class. I take an interesting class at a university. It’s about Japan in the U.S. films. The class started yesterday, and the first movie I saw was the Cheat. The Cheat was released in 1915, when the world was amid the World War I. Starring actors of the film are Fanny Ward and Sessue Hayakawa. Sessue is said that he is the first Japanese actor who came to the top in Hollywood. There are only three main characters in the Cheat: Tori, the mysterious oriental rich acted by Sessue, Edith, the shopping spree wife acted by Fanny and Richard, her husband. Edith loves shopping. She always shops something, especially luxury clothing. Her husband Richard is a kind of workaholic and is always angry about her lavishness. Edith complains about her husband’s meanness to Tori, the rich man. Edith is a treasure of Red Cross, which has many charity parties for war casualties in the World War I. She holds a high amount of money to send to Belgium. She, who is frustrated with her husband, put in all of the collected money for investing. But she lost all of the money. Edith has to send the amount of money to Belgium next day. It is Tori to come to the aid of her. He presses her to sexual relationship in exchange for money. She agrees and gets money to send to Belgium. That night Edith’s husband Richard tells her to have gained by an investment. Edith takes a lie to him to have lost a game and need money. She sneaks out of the house and goes to Tori with the money and asks him to scrap the agreement between the two. Tori, however, doesn’t accept it and forces a kiss on Edith. He grabs her hair and brands Tori’s mark on her shoulder when she struggles and tries to escape. Edith shoots him. She flees from the place, but Richard follows her and is the site. Richard takes the blame and is arrested. But in court Edith shows her shoulder in which there is a Tori’s brand and claims that she shot Tori but it was self-defense. People in court get angry to Tori and try to kill him. After all, Edith and Richard win acquittal. As I wrote at the beginning, the world in 1915 was amid the World War I and was unsettled. Those days in the U.S. a growing number of immigrants from Asia come and many white people saw it as a threat, especially after Japan’s victory on Russo-Japanese War. 1. It’s not good to work too much without seeing their families for husbands. They should be family men. Otherwise, wives may become out of control. 2. It’s bad to go out for wives. They should stay home and look after their husband. Otherwise they may get into danger. The film didn’t appear in Japan, which was angry at it, at that time. And Sessue was regarded as a traitor in Japan. But interestingly he got more and more popular by the film in the U.S. It seems that his mysterious character was an irresistible attraction for American women. Movies are useful to learn the age when the movies are made. They mirror the society. It’s interesting to know what people think of Japanese people in the U.S. at the beginning of the 20th century.